What a blessing it is to witness a blessing being passed on, even after we have left and come back home! 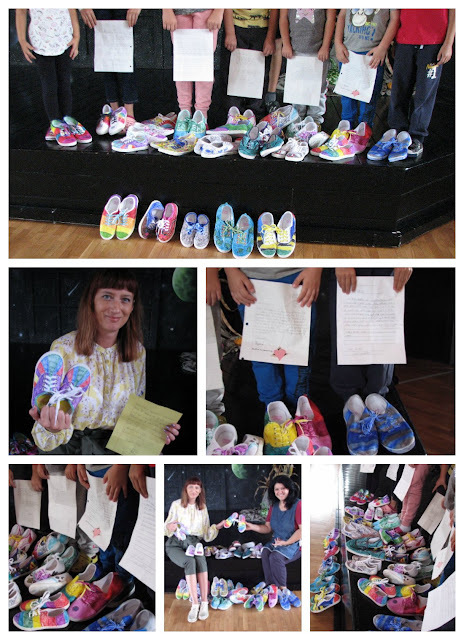 In these pictures you see the shoes that an elementary school in the Northeast made and wrote letters to go in each pair. We in turn gave these shoes to the SOS Children's Village in Croatia. We have been working with this particular orphanage for the past 10 years and this past week, they decided to pass on some of the shoes to the needy children in other parts of Croatia! It is such a blessing to witness people passing it forward! We look forward to hearing whether any of the children receiving the shoes will become an old time pen pal and make contact! We are so blessed to be a part of this wonderful opportunity to love people right where they are and love them till they ask why!